The Honeywell Orbit 7120 scanners maximize your customers"™ satisfaction and employees"™ efficiency with a patented 20-line scan pattern, an easy-to-find sweet spot and a scan speed of 1,120 scans per second. The Orbit series features an award-winning design that's compact, lightweight and rugged. Its shape enables handheld scanning of large, bulky items. And for added flexibility, the scanning head can be tilted within a 30 degree range to accommodate objects of various sizes and shapes. Honeywell's Orbit 7120 omnidirectional scanner-the all-time, best-selling hands-free omnidirectional laser scanner-is an innovative, elegant and affordable solution for convenience retail applications where counter space is at a premium. Recipient of multiple design honors, the Orbit omnidirectional scanner has an award-winning shape that enables hand-held scanning of large, bulky items. 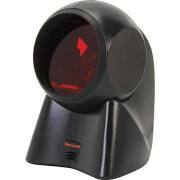 This laser scanner offers an omnidirectional pattern scan line which provides aggressive presentation scanning. 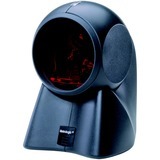 The scanner also has an adjustable head to target scanning for larger products.